On February 13, 2008, Community Living Manitoba hosted a day long event which uncovered issues surrounding individuals with intellectual disabilities. 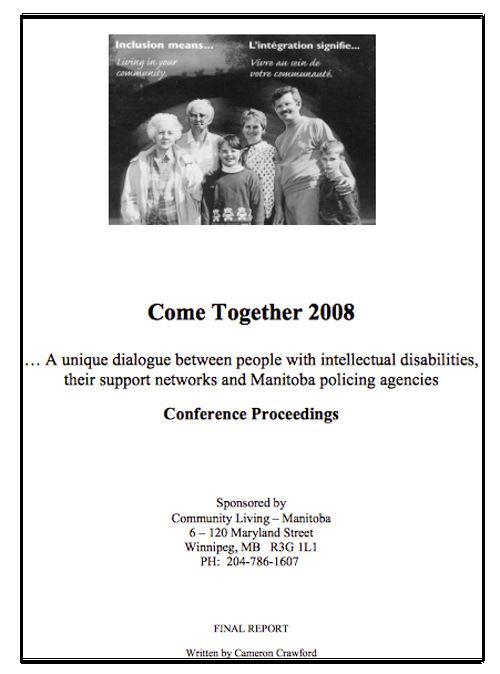 Entitled ‘Come Together 2008’, the conference brought together police officers, government representatives, advocates and individuals with intellectual disabilities and their families. Areas which became recurring themes in the conference included, the vulnerability of people with intellectual disabilities, and the issue of overprotection was discussed. Trying to find a balance, the conference provided key insights on topics, such as relationships and informal safeguards, power, control and choices for individuals and criminal justice process and formal safeguards. This report provides a summary of key points and directions for action that emerged from discussions at the conference.